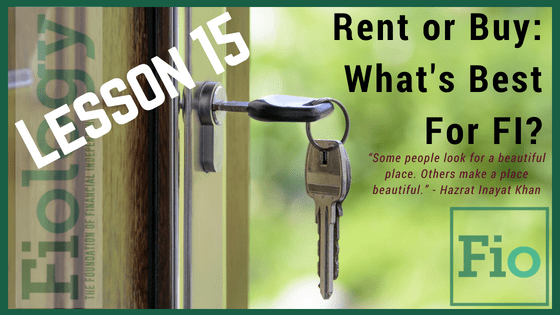 Rent or Buy – What’s Best for Financial Independence? For most, housing is our largest monthly expense. It can have a significant impact on our FI plan. Assuming that living under a family member’s roof, paying little or no rent, is not an option, this decision should be deliberated at great length. There is no shortage of articles or blog posts advising whether renting or buying a home is a better option. As with most things, there is no absolute answer as each one of us have our own unique circumstances and personal factors to consider. Generally, due to the number of responsibilities for which a homeowner can be liable, and a number of other factors like flexibility in uncertain times, it is healthy to default to renting and to consider purchasing a primary residence only when the numbers are overwhelmingly in favor. However, there are other factors to consider than simply the numbers that may justify buying over renting. This lesson provides a variety of ways to think when contemplating renting or buying your primary residence. It offers solid guidance to consider when making this vital decision. Making a smart decision for housing, one of the Big Three, can propel your Financial Independence journey. Note: This lesson focuses on purchasing or renting a primary residence. Homes purchased as rental real estate investments should be scrutinized by an entirely different set of standards. It rarely turns out your current ideal primary residence becomes a future ideal rental property. If you do choose to buy rather than rent, you can attempt to mitigate downside risks by screening potential purchases of a primary residence as if you were buying it as a rental real estate investment. Take Action: If you are a homeowner or considering purchasing in the near future, explore The ULTIMATE Rent vs. Buy calculator. If you are renting, enter information as compared to similar housing available for purchase in your area. You may discover the potential for a positive change or you may discover reinforcement of your current housing decision. This is a seemingly contentious area in the FI community, although for me what it really boils down to is personal preference. I bought my first house at the height of the market, and ended up losing money on it 8 years later. That being said, the house I bought at that point, my current home, is not only an incredible value (and worth about $50k more than we paid for it) but it is a great little house in a beautiful spot. I feel a little more secure knowing there is no landlord to decide we have to leave on a whim, but of course, since we don’t have the mortgage paid off, the bank could potentially decide they want it back. For us, having this great house in a fantastic neighborhood with good friends living all around us provides all the value we could ever need, so owning is the answer. There are plenty of options, though! 100% spot on. When we have to move, we enter the decision from a renter bias. But if the numbers and other factors, like some you mentioned in your comment, become overwhelmingly in favor towards buying, we buy.